A smaller version of our popular KSF Series 1. With retail space at a premium and a growing surge in pop up shops we found many requests for a smaller version of our popular KSF Series 1. The Ksf Series 1 is still the same strong cast iron body but the table is reduced to 250 mm wide x 205mm. 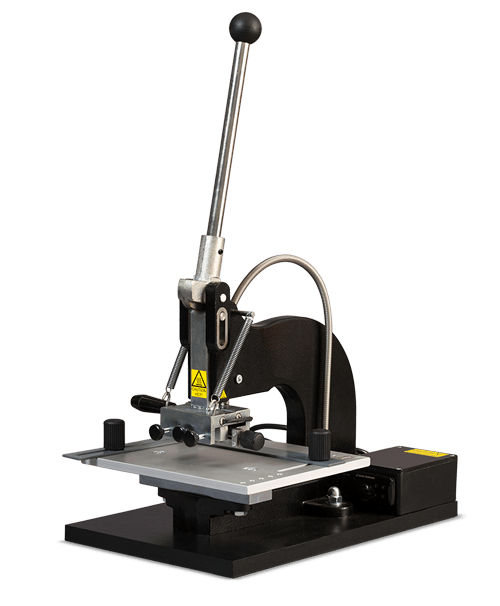 The hot foil press also comes as standard with engraved ruled table for ease of set up of goods. The overall footprint is 400mm x 255mm and its 4kgs lighter. All this helps make it just a little bit more versatile and as another famous brand says – every little helps! The KSF mini still has all the same great features of its big brother – self centring type holder, side and rear gauges and the excellent craftsmanship and build you can expect from a Metallic Elephant press.